A stunning ring featuring certificated tanzanite and diamonds set in 18ct white gold. Modern with a vintage feel, this beautiful piece is the perfect token of love for your special someone. 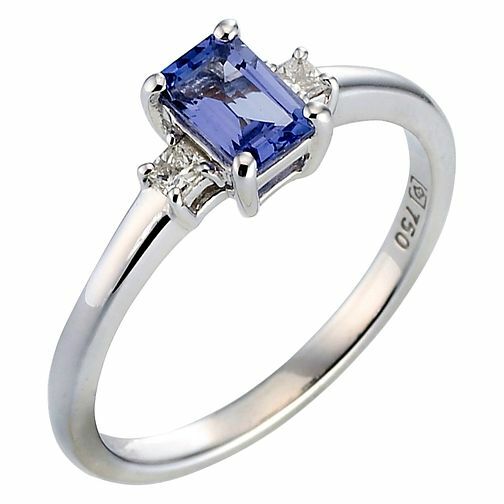 18ct white gold certificated tanzanite and diamond ring is rated 3.5 out of 5 by 2. Rated 2 out of 5 by Anonymous from sparkly stones, but significant discoloured white gold after 3 months I have only had this ring for 3 months as an engagement ring. The white gold is already discoloured quite significantly in one part. I don't Work in a manuel job, I own a dishwasher, take it off when cooking or washing up, I certainly would never wear it while using cleaning products, and would wear gloves as I have eczema on my hands anyway. It's very pretty and sparkles in the light, I understand that white gold discolours and needs re-dipping, but not after 3 months. Rated 5 out of 5 by Anonymous from Beautiful Engagement Ring My Partner got me this ring as an engagement ring and it is perfect! I get so many compliments on it and love that it is an wonderful alternative to a diamond. I have had it over a year and it is just as sparkly as it was when I first received it. Now I just need a wedding ring to go with it!